(Bloomberg Opinion) -- Put the champagne back on ice. The telecommunications industry’s 5G bonanza has been delayed. Nokia Oyj said that spending on next-generation 5G equipment by mobile carriers will be “soft” in the first half, and flat overall for 2019. Growth will return in 2020. It shouldn’t be a surprise. 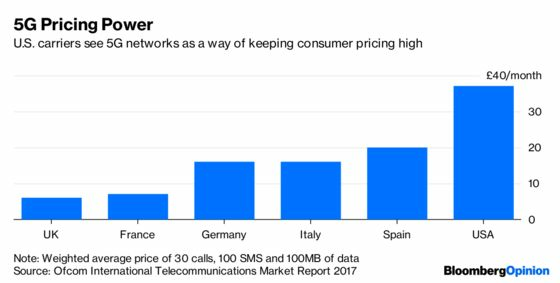 European carriers have repeatedly emphasized that they don’t want to front-load the spending on 5G networks, and would rather feather in the technology to match consumer demand. In Germany, the dominant three carriers have gone so far as to sue the government in a bid to slow the pace of the roll-out. The Europeans simply don’t see the demand yet. Augmented reality headsets and self-driving, web-connected cars aren’t going to become mass market products any time soon, maybe even for another five years, so there’s little need for widespread, low latency mobile connections. 5G technology is instead seen as a way of delivering data more cheaply. The story is slightly different in North America, Nokia’s biggest market. Verizon Communications Inc., AT&T Inc. and T-Mobile US Inc. see 5G as a competitive differentiator which will enable them to sustain the high prices they charge consumers. But Verizon said on Tuesday that capital expenditure will climb by a modest 5 percent this year. Chief Executive Officer Hans Vestberg told investors that he’s waiting for the arrival of a standardized set of 5G equipment that will go into customers’ properties before spending more – and that gear that won’t be available before the second half of 2019. That’s also when Nokia CEO Rajeev Suri expects spending to pick up. Firms like Verizon want to spend the money, but they can’t. 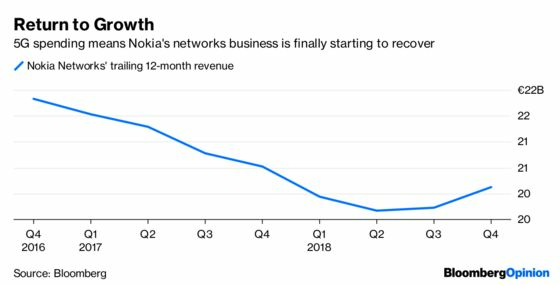 To be fair to Nokia, it hadn’t been overly bullish for 2019. Back in October, Chief Financial Officer Kristian Pullola demurred when asked how optimistic he was about the U.S. market for this year. A Nokia investor will be justifiably perturbed by Thursday’s share reaction. The stock fell as much as 7.3 percent after the fourth-quarter earnings report, with the focus on the 2019 outlook. Rival Ericsson AB’s shares jumped when it published its fourth-quarter numbers last week. But unlike Nokia, Ericsson didn’t publish any guidance for this year. It looks like Nokia is being unfairly punished for its transparency. The focus should really be on Nokia’s slower pace of growth in the fourth quarter. Networks revenue climbed 6.6 percent, trailing the 12 percent growth Ericsson’s comparable business posted in the same period. The pressure is therefore on Suri to demonstrate that Nokia isn’t losing market share. That’s even more important given the mounting antipathy toward rival Huawei Technologies Co.: Nokia won’t want Ericsson to benefit disproportionately from the Chinese firm’s woes. Investors shouldn’t panic yet. The 5G spending will eventually materialize. But Nokia has to do more to prove it will be the main beneficiary.